AlphaBet Club is looking for volunteers… As the AlphaBet Club continues to grow, we’re increasing our volunteer team to support various initiatives. We wanted to know if you (or someone you know) might like to join the ABC team in Amsterdam. 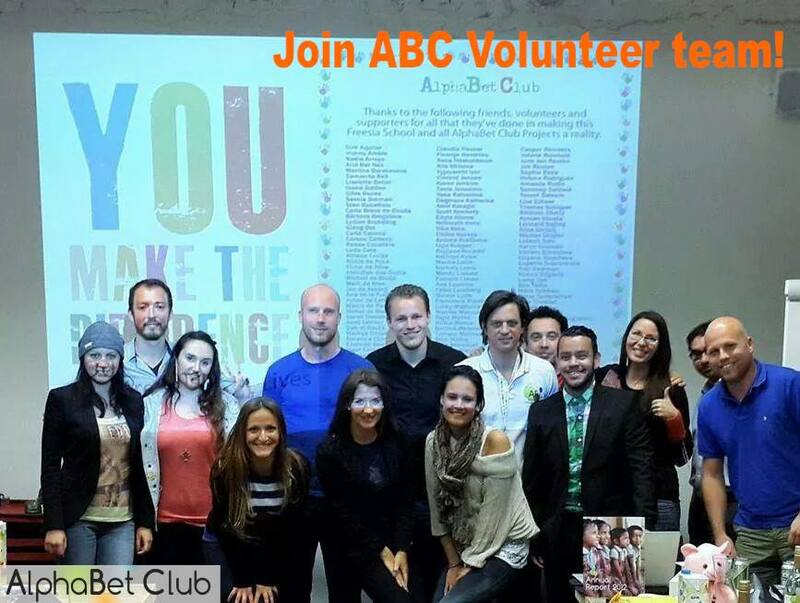 ABC is a Stichting/Charity/NGO where most all activities are done by 40+ volunteers in Amsterdam, Madrid, US and India. Marketing Manager – Plans, directs, and coordinates the marketing and communications activities and long term marketing strategy of the organisation. Manages a team of volunteers to create, coordinate, launch and monitor ABC marketing campaigns and creation of online and print marketing communications and materials. Content Marketing Manager – Responsible for creating, managing and producing content related assets about ABC Projects or organization to enhance communications with our community and organizations interested in collaborating with ABC. This includes initial copy development, editing of contributed content; ensuring all content is on-brand, consistent in terms of style, quality and tone of voice, and optimized for social promotion. PR / Media Relations – Responsible for managing communication between ABC and various media outlets, using press releases, media events and online mediums to improve relationships with media sources and journalists to obtain optimum media coverage for AlphaBet Club. Email Campaign Marketing Lead – Responsible for managing, optimizing, analyzing and creating email marketing campaigns to better engage and share ABC info with our community via email. Including the proofreading/editing of outbound emails in line with tone of voice and style guide; carrying out segmentation of CRM and implementing marketing/engagement strategies; A/B and multivariate testing on email campaigns; Reporting on email campaigns suggesting improvements and running the overall email calendar for the AlphaBet Club. Copywriter– Responsible for creating well-written, compelling copy for ABC marketing and/or communication materials. Examples include: web page or newsletter content, brochure, one-pager/fact sheet, or fundraising / promotional material. WordPress Developer – Responsible for the maintenance and future functionality enhancements for ABC’s WordPress hosted website. Fundraising Project Manager – Responsible for creating and launching outreach campaigns and activities soliciting and gathering of monetary donations, recruiting sponsors/grants and optimally engaging fundraising event attendees to drive more donations and better relationships with donors. Charity Project Manager – Responsible for managing aspects of ABC Education projects, working with Project Partners in implentation countries to stay in sync, while managing project deliverables and creating, maintaining and sharing updates and information with donor partner/s and others at ABC. Graphic Designer – Digital Flyers – Prepares visual presentations by designing art and copy layouts, primarily digital banners/flyers or photo collages that we use in online social media and website communications. Event Production – Do you have (or interested in) event planning or event production experience? We’re looking for people that can coordinate and execute various aspects of an ABC event. Join as a volunteer to support our Event Production Leads, or to be an Event Lead. ABConnect Event Manager – Responsible for the internal coordination of ABC Amsterdam Events team hosting montlyABConnect (Free) Events at different venues in Amsterdam. Responible also for managing ABC Amsterdam Meetup Group. Amsterdam Event Online Promotions Coordinator– Responsible for online promotions that ABC has to drive awareness and attendance at ABC Amsterdam bimonthly fundraising events. Includes internal outreach to ABC Amsterdam Ambassadors for promotion of events. Why volunteer with ABC? Meet fun internationally minded people involved in many different activities in Amsterdam and abroad, while helping to make an impact opening schools for children in need. How much time? And what type of commitment required? Volunteering can be anywhere from a few hours a week/initiative to as much time as you’d like. We are looking for people that are interested in holding these roles for the next year. 1) In which area would you consider volunteering for with the ABC? 2) What experience do you have in working in this area? Please be specific and feel free to write (a lot) about your experience here. 3) Please share with us your previous interactions with the ABC (ie events attended etc) and why you think you’d enjoy volunteering with our organization. We look forward to receive your email and to meeting you to share additional info on our organization and volunteering opportunities. Have Fun. Make a Difference! We are always looking for volunteers to who are interested in contributing their time and expertise to both ABC events and charity teams. Volunteering is flexible, fun, and a great way to meet international like minded people. Interested in learning more or receiving an invite for the next volunteer meet up? Let us know a bit about you and how you’d like to get involved, Thank you!